You can now see a set of photos that I took in Ban Tan on Dec. 25 and 26, 2010 while visiting Junhom Bantan, a cotton weaving group in Northern Thailand. Alleson will post later to this blog with highlights and impressions from this visit. For now, I'll just say that building our fair trade relationship with this group has been a delight! We're impressed with their commitment to using natural dyes, protecting their environment and creating "green products." We look forward to sharing this group's cotton handweaving with you upon our return to Canada in Spring 2011. We'll have traditional Thai fishermen's wrap pants, cotton scarves in various weights and -- new for this group -- a beautiful undyed silk/cotton scarf made from a mix of Eri silk (handspun silk) and unbleached cotton. 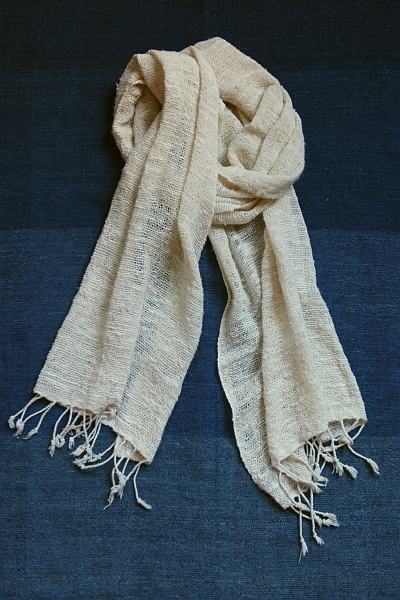 Alleson has been wearing this scarf in the last week and loves its soft, yet nubbly texture. If you're on Facebook, we invite you to visit (and like!) our TAMMACHAT Facebook page. If you're not on FB, you can still see our public Ban Tan photo album.